Japan 2019 presents Japan Night will be held in New York City on May 12, 2019 to celebrate contemporary popular Japanese music with four of the most successful artists in Japan today. 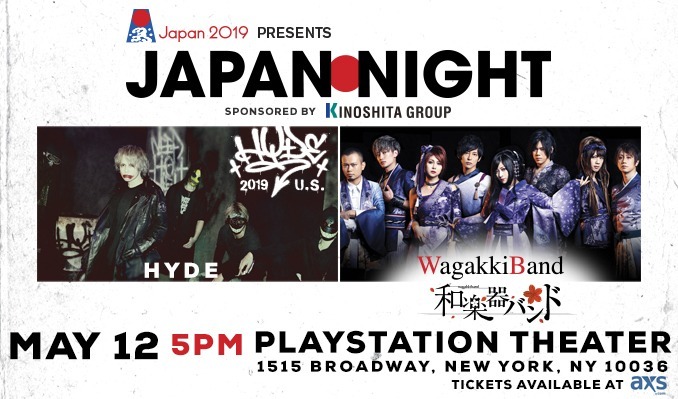 At PlayStation Theater (1515 Broadway), HYDE, who is also known as a lead singer of L’Arc-en-Ciel, a pioneer of Japanese rock, and WagakkiBand, a viral video sensation who combines traditional Japanese instruments with modern rock, will perform at 6pm. Throughout his career so far, HYDE has recorded more than 300 songs, with 60+ songs breaking the Oricon (Japanese Billboard Chart) top 10. Still active with L'Arc~en~Ciel, HYDE took a break from VAMPS in early 2018, to reinvent himself yet again as a solo artist, releasing 3 new singles back-to-back: “WHO’S GONNA SAVE US”, “AFTER LIGHT”, “FAKE DIVINE”, and “ZIPANG”. HYDE shows no signs of slowing down with his 12th single “MAD QUALIA” scheduled to be released on March 20, 2019, a World Tour just announced to be starting in Asia in March 2019, a US tour on the books for May 2019. WagakkiBand fuses Shigin (poetry recitation, one of Japanese classic performing arts), Wagakki (traditional Japanese musical instruments) and Rock. The music video of “Senbon Zakura”, included in their 2014 debut album, has been viewed more than 100 million times on YouTube and received a countless number of comments and shares from all over the world. After five years, they now sell out arena shows and perform at special stages such as national treasure and cultural heritage sites including Heian Shrine and will perform at Izumo Taisha (Shrine). WagakkiBand has been performing worldwide and their special live organized by Tencent streamed more than 100 million times in the first 24 hours.